Managing service accounts is one of those tedious jobs that tend to annoy me. Changing the passwords of these accounts regularly is a good security practice, but takes a lot of time and can be difficult to manage. In other words, a perfect task to automate with Powershell. This call is easy to decipher. 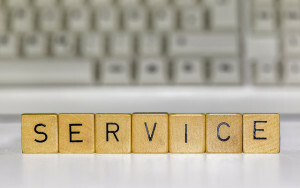 Using the .Change() method of the service class, we can update the service account name and/or password (as well as other properties of the service). You probably noticed the number of arguments the .Change() method takes, which makes it cumbersome to use. The other gotcha is that the service still needs to be restarted in order for these changes to take affect. Depending on your need, these gotchas can be good or bad, but can be handled depending on how you code around it. If you’ve managed services through the GUI, using this method probably makes you think of how you manage accounts through the services MMC console. However, most SQL Server folks will use the SQL Server Configuration console instead. These two methods are subtly different, where using the SQL Server Configuration console will handle some additional tasks (such as restarting the service) as part of its interface. If we want to manage our SQL Services in the same fashion, we can leverage a part of the SMO, the Wmi.ManagedComputer Wmi.Service classes. We first need to load the SqlWmiManagement assembly, just like loading the SMO libraries if we were using that functionality(note: this library is loaded if you load the SQLPS module). Then we need to instantiate the Managed computer object and retrieve the specific service we want to alter. The final step is to just change the service account. This works about the same as the base WMI approach, though we’re altering the service by using the same functionality as the SQL Server Configuration Manager. This means that once we change the service account, it will force a service restart. This is good and bad. The good is that it will apply the change immediately and you will know right away if the account change is valid. The bad is that you can not delay the service restart, so if you use this method you want to be sure it is a good time to restart your SQL Service. I have built a function around using the second method that makes handling this process a little easier. Also, because I’m not a fan of passing passwords in plain text, I built the function to take a PSCredential object to keep my account information secure. In order to spare you the wall of text, you can view the full function on my GitHub repository. Decoding the credential in a way to keep the account information secure. Managing the service names based on the instance name (passed in the standard HOST\INSTANCE name format). Restarting the SQL Server Agent service if it is not running after up restart the SQL Server service. Accept a list of instances and process all of them. This simple pattern and function will not only make managing our security policy easier, but also more consistent. Using a simple list of servers from a text file, a database table, or even our Central Management Server and combining it with this function means we ensure that we are applying these changes to every server in the list. This is how we can build for automation, focusing on making simple tasks like this repeatable and consistent. Aaron Nelson(@sqlvariant) for blogging about this method originally on the Hey Scripting Guy! blog. John Sterrett(@JohnSterrett) for asking me a question that resulted in this function.